Severely autistic people aren’t primarily known as globetrotters. They like routines and familiar surroundings. Our son John, eleven years old, severely autistic and non-verbal, is no exception to this. But he also really likes to travel. As soon as we realized that, we were on the road and have traveled a lot throughout Europe since. 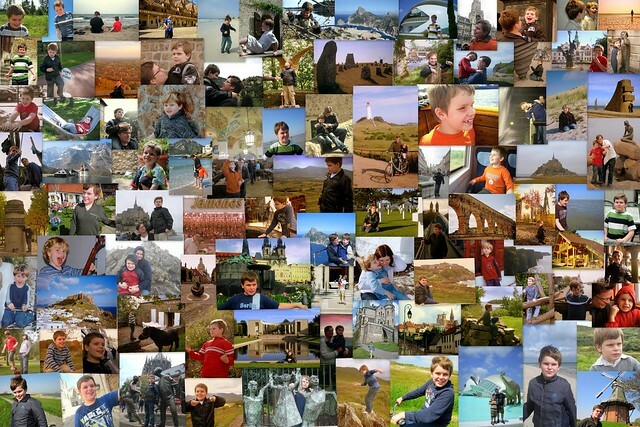 We would like to write a book about our experiences, for anyone who is interested in travel and/or autism. ~ See in larger size here. During our travels, John fell in love with Ireland’s rugged Connemara. We experienced Sweden as the most handicapped-friendly country: public playgrounds were equipped with swings for wheelchairs, and people were very sympathetic towards John, even when he featured his signature combination of very loud noises and unusual body movements. John explored historical locations with us, from the D-Day sites in Normandy, France, to Theresienstadt concentration camp in the Czech Republic. He developed an interest for architecture after seeing the futuristic City of Arts and Sciences in Valencia and the Gaudí buildings in Barcelona. On the Dutch island of Texel John quite unexpectedly learned to ride a non-specialized tandem bike. He hiked eleven miles in one day with us, no small feat – 2,000 feet up and down the mountains of Northern Italy. But John also went on a strike in the vineyards of Burgundy and refused to walk any further – in the middle of nowhere. In plus 90° heat on the Mediterranean, he escaped into the air-conditioned house and insisted on watching “The Sound of Music” over and over again, for two weeks. Sometimes our trips were carefree and characterized by pleasant encounters, sometimes it was harder than anticipated. As we experienced Europe from our unique perspective, we learned a great deal about how other countries look at autism and people with handicaps in general. There is a considerable amount of talk about autism. The perception of life with autism is still widely dominated by two narratives. On the one hand, there are the unrealistic “tales of overcoming.” As soothing as they might be for society, they tend to throw the affected families into a nerve-wracking, never-ending search for cure. On the other hand, there are the “tales of desperation”, which try to counter the unrealistic perspective, but themselves also get caught in a hopeless position. With our text, we would like to search for a middle ground: a realistic look at a multi-faceted life in which we fully accept autism as a life-long condition, and in which we experience both struggle and difficulties, as well as pleasure and happiness. The text is intentionally set outside our every-day routines. Dealing with bouts of aggression, sleep-deprivation, school issues, diapering and bureaucracy can make for quite a tedious day-to-day life in which we get caught up in our many tasks. Traveling puts our little family of three willfully in unknown situations. A true challenge with an autistic child, but we were and are convinced that it is possible and worthwhile, also for John. Even though – and especially because – he has problems understanding the world around him, exposing him to new landscapes, people, languages and situations offers him the ability to appreciate the spectrum of experiences that the world has to offer. And every time we announce a vacation and hit the road, John is thrilled. The title “Tomorrow can wait” refers to the fact that we surely have many worries (the ultimate one being: what happens to John when we are gone?) and difficult times ahead, but tomorrow can wait when we take a step back and let life give us new perspectives by embracing travel as an opportunity – even with a severely autistic child. If we meet our funding goal, we will self-publish the book (unless we find a publishing company) as a paperback, 6 x 9 inches, approx. 200 pages. We will publish the book first in English, then in German. If you're interested, read the book's introduction Be in the world and an exemplary chapter over at our book blog "Tomorrow Can Wait."